A 12mm resilient acoustic layer laminated to a 22mm t&g cement particle, premium quality overlay board. The slim profile and high acoustic performance of Acoustic Deck 34 premium overlay board makes it ideal for timber floor refurbishment projects. 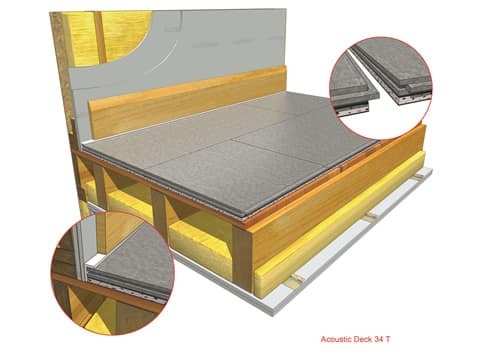 Premium Quality Overlay Board: Acoustic Deck 34 is ideal for overlaying directly to an existing sub-floor. Convenient: Easy to install and always available for fast delivery nationwide. JCW Acoustic Deck 34 has been tested and certified to provide the necessary acoustic insulation required for compliance with part ‘E’ of the Building Regulations for both impact and airborne noise.See data sheet for details of acoustic performance and installation guidance.